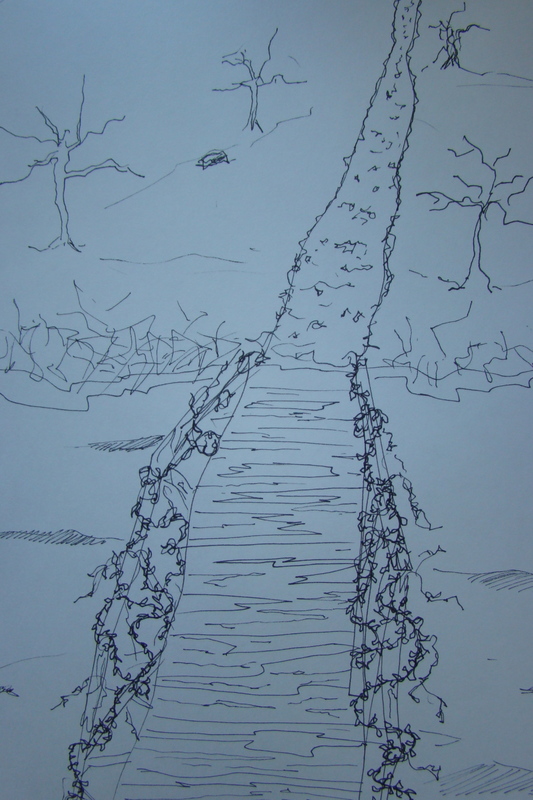 Crossing over the Bridge of Despair into the Shadowlands, I became aware of a morbid feeling in the pit of my stomach. Freedom’s gait slowed significantly as well, his intuition kicking in. The bridge was old and weather-worn. The sides had nearly tumbled into the water, hanging on by vines that had wound their way around the rotted wood. The water below was murky and dark. After very cautiously crossing the bridge, the general atmosphere was one of overall lackluster, the air foggy with mist, gray and damp. There was no flourishing flora nor fauna to speak of, with the exception of trees that had long since died, leaving detritus behind. The road, if one could call it that, was filled with holes and rocks that hindered travelling at, what would be considered, even a slow pace. There was a marked stillness; the sound of silence. I have heard stories about the Shadowlands…. being said that it is a land or region of shadows, phantoms, un-realities, or uncertainties. It is also said to be the shadowland of imagination. Totally aware of all of this, I still chose to travel through this space as a test of my newly found strength found at the Place of Power. It was not long before I saw something at the end of the long stretch of the half road, half trail–what looked like a place of shelter, although shabby and windowless. As Freedom and I approached, I could see that the door, which was hanging from rusted hinges, was slightly ajar. I heard something; Freedom reared at the sound. A hand reached out of the doorway, holding a magnificent walking stick. It was made of wood, gnarled and twisted, with a handle round and brilliant. I was shocked to see a creature emerge. I did not know if it was a she or a he, even though I was only 4 feet away. This creature was bent over slightly and looked very ancient. It had pointed ears and large eyes with huge dark circles beneath them. 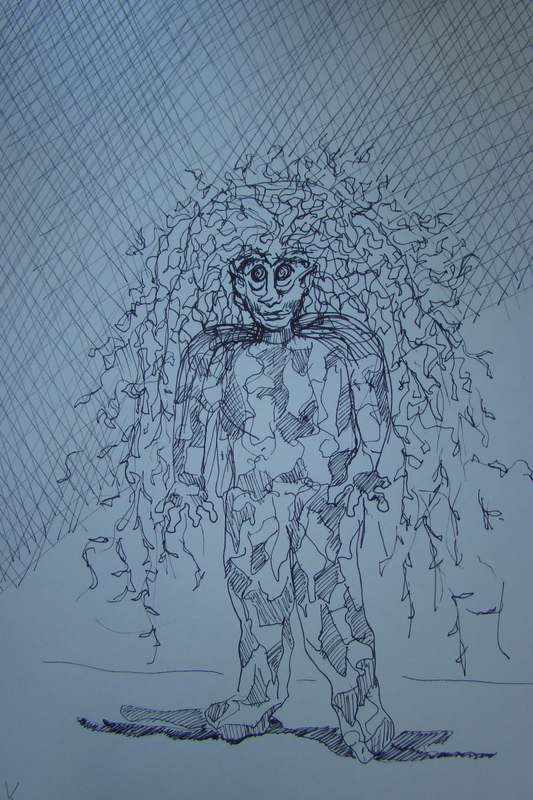 Its eyebrows were magnificently bushy, and its hair looked like the vines that had held up the sides of the bridge crossing over into the Shadowlands. It was covered with a material of multicolored earth tones, and its fingers were twisted and gnarled like the roots of an old tree in the forest. I could hardly believe my eyes…. who would live in this savaged land? We looked directly at each other, eye to eye, and its eyes seemed to contain all the woes of the world. I asked, “Who are you?” The creature did not speak, but communicated with me telepathically. It answered, “I am the Keeper of the Shadowlands”. I asked, “And, what is it that you keep?” It answered, “All of one’s sorrows and disappointments, fears and uncertainties, losses and feelings of remorse.” He moved forward a bit, slowly making its way towards us. “It is difficult to move, as I am weighed down by the woes of so many,” it said. “What is it that you would like to rid yourself of,” the Keeper remarked. Yes Linda. The Keeper is a holder…. I think I was remembering the character in the movie, “The Green Mile” and somehow came up with The Keeper.